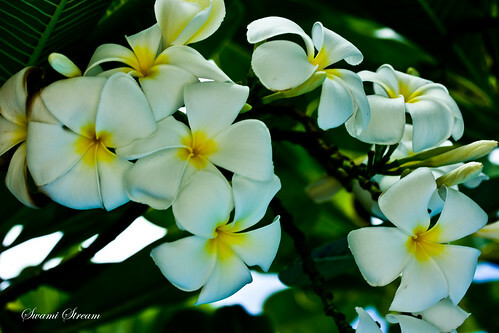 Plumeria flowers are used in art, in jewelry, as decorations and to represent different meanings in different cultures. Therefore, what you want to say with your plumeria gift depends on what culture you belong to and what meanings the gift receiver attaches to plumerias. credit: "Frangipani at Cosy Beach" is Copyrighted by Flickr user: Swami Stream (Swaminathan) under the Creative Commons Attribution license. Plumeria flower is easily recognized by its gentle and sweet fragrance. It has five small--about two to three inches in diameter--teardrop-shaped petals, and the color of the flowers vary from white, pink, yellow, red and orange to pastel colors. In China, plumeria flowers are tokens of love. In China, it is not accustomed to share personal feelings, but giving a plumeria flower to your sweetheart has the same meaning as saying "I love you" or "You are special." Chinese consider plumerias even more precious than orchids. In Hindu culture, plumeria flowers represent loyalty, and young brides wear plumerias in their hair on their wedding day to show their loyalty to their new husbands. In Vietnam, plumeria is the flower of the educated and westernized upper class. Therefore, plumeria flowers are used to show status in society.